Sri Sri Satchidanandendra Saraswathi Swamiji (1880-1975) the founder of Adhyathma Prakasha Karyalaya Holenarsipur was the celebrated authority on Shankara Vedanta during the twentieth century. He researched and worked with profound dedication and a missionary zeal throughout his life for bringing out and present to the seeker the pristine pure Advaita Vedanta according to the tradition of Gaudapada, Shankara and Sureswara. He is reverentially hailed as Abhinava Shankara of the twentieth century. Shankara who appeared more than a thousand years ago recovered the true spirit of the Upanishadic Texts and the Vedantic Tradition from the multitude of wrong interpretations prevailing at that time Sri Sri Swamiji who appeared on the scene during the last century devoted his life time to recover the pristine pure Vedanta of Shankara and the tradition of Adhyaropa Apavada Prakriya of the past Masters by cleansing the distortions and misrepresentations of Shankara in the post- Shankara sub-commentaries, collectively known as Vyakhyana Prasthanas. Sri Sri Swamiji, was an erudite scholar, a prolific writer and a great organizer; He wrote over 200 books in Kannada, English and Sanskrit, including Kannada translations of all the original and genuine works of Shankara. All his writings are characterized by precision, lucidity and erudition. Many of his independent books like Vedanta Prakriya Pratyabhijna, Mandukya Rahasya Vivritih and Kleshapaharini (commentary on Naishkarmya Siddhi) in Sanskrit, Essays on Vedanta and Salient Features of Shankara Vedanta in English, Paramartha Chintamani and Shankara Vedanta Sara in Kannada are real master pieces. Sri Sri Swamiji‘s life is an inspiration and a model and his writings are a real boon for all the earnest seekers. Sri Sri Satchidanandendra Saraswathi Swamiji’s autobiography and History of Karyalaya was published in Kannada in two parts, during 2006. These volumes are quite extensive and contain almost all the details of Swamiji’s life history as well as the growth of Karyalaya. Prior to this, during 1973 the Swamiji’s life history was published as ‘Karyalayada lthihasa’ (History of Karyalaya) in Karmada. Later, this book was modified and enlarged, and published under the title Sri Gurucharithamritha in the year l997. The writer of the latter book was late Sri H.S. Laksminarasimha Murthy, who was Karyalaya pundit, writer and editor of several Karyalaya publications. It is this Kannada book that has been translated now into English by Smt Savithri Devaraj. Smt Savithri is an Engineer by profession and is currently located in the USA. Her maternal grand father Sri Kudlur Tarikere Srinivasaiah was a great devotee of Swamiji and knew him very closely. His devotion to Swamiji as well as the thirst for Vedantic knowledge has been imbibed by Smt Savithri. Keeping in mind the non-kannada speaking readers and followers of Swamiji in India and the West, she has done this translation. She has made a munificent donation of a thousand dollars also to the Karyalaya, towards the printing cost of the book. The Karyalaya is grateful to her and invokes the blessings of Swamiji and the Grace of the Lord for success in all her pursuits for acquiring as well as propagating Vedantic knowledge. Swamiji’s life history is an inspiration to the seekers of spiritual knowledge. His early life was no different from that of a common man with its many odds, trials and tribulations. However, with sheer determination and focus he pursued Vedanta by earnest and continuous efforts companionship and satasanga with pious and enlightened persons and above all as he himself has said elsewhere by constantly remembering the lotus feet of Shankara he acquired the enlightening Vedantic knowledge. His devotees and seekers reverentially called him Abhinava Shankara. Swamiji’s life is not only an inspiration but a model for the earnest Seeker. The Karyalaya was in the center of all activities of Swamiji; and that legacy has continued even now Right from inceptions and now functioning as a Public Trust, the Karyalaya always been eager to be transparent in all its transactions. 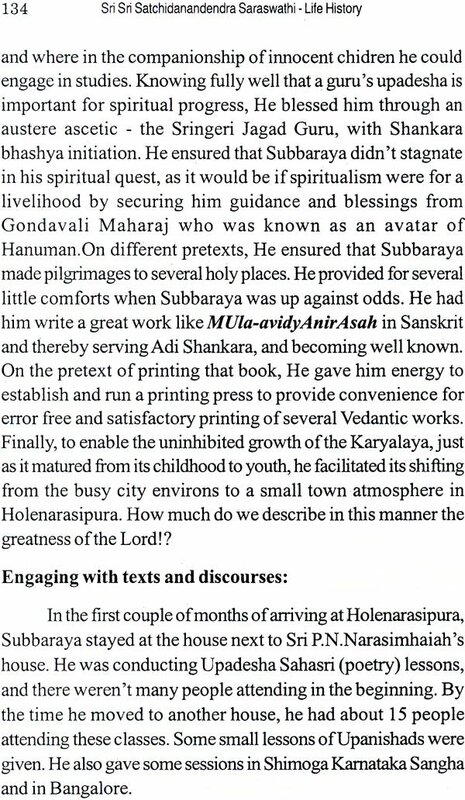 The discerning reader will not miss this point as he goes through this book which is as much a history of the Karyalaya as it is the biography of Swamiji. Finally, the value of the present book has been greatly enhanced by including an Appendix, which is an extract of the English portions of the Karyalaya publication in l 962, by name Vedantins Meet. Swamiji’s life time mission was to bring out present to the seeker Shankara’s Advaita in its pristine pure form, and state clearly the deviations in the works of post-Shankara commentators. While he successfully did this in his Bhashya translations and other innumerable books in Kannada, English and Sanskrit, he spared no efforts to propagate the same. He traveled extensively all over India to meet and discuss with and philosophers. His unique attempt in this direction as is organize a Vedantins Meet, by sending an Appeal to Thougl1tful Vedantins, which is nothing but a set of searching questions concerning the fundamental concepts of avidya, adhyasa and maya according to Shankara vis-à-vis according to Post—Shankara commentators. The Appeal and the responses received from several Vedantins are available fully in Sanskrit, along with an Introduction by Swamiji in the book Vedantins Meet. However for a wider readership, Swamiji provided some English translations also in that book, which are printed here as Appendix-l. The seeker will surely find it very rewarding and revealing to read this part of the book also. For the benefit of the readers the list of English & Sanskrit books published by the Karyalaya is included in Appendix-II. Our thanks are due to all those who have participated in this endeavor directly or indirectly to bring out this book; and also to Smt. Sudha of N.R. Colony, Bangalore for good typesetting work & excellent printing with attractive cover page and Photo of Late H.S. Laxmi Narasimha Murthy done by Sri Nagaraj, Standard Printers, Bangalore. The Karyalaya humbly offers yet another flower in the if form of this book at the lotus feet of Swamiji and prays that the readers welcome the book. This is my first attempt at a task of this magnitude, so I request readers to graciously excuse my slips and misses. I consider it a great privilege to translate and document the monumental task Swamiji accomplished in his life. 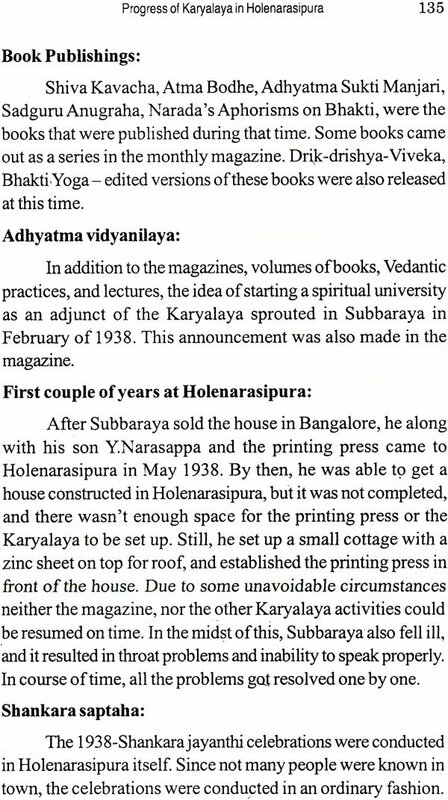 Originally I took permission from Karyalaya to translate Swamiji’s biography to English and post sections of it on the Satchidanandendra e-list website for the benefit of Western and non—Kannada speaking followers of Swamiji. When the translation was completed, I checked with Karyalaya to see if publishing it would interest the non-Kannada speakers, but there didn’t seem to be enough interest. Swamiji’s autobiography of 700 pages had just been released in Kannada; it didn’t seem likely that there would be a demand for a translated biography when Swamiji’s autobiography in his own words had just been released. While translating the new 700 page autobiography to English would take a lot more effort and time, I sincerely feel that the beauty of Swamiji`s narration and the genuine landscape revealed in his autobiography deserves to be preserved in the original, in Kannada as he wrote it. Perhaps considering this, Karryalaya later requested me to add "Vedantin’s Meet" to the Appendix—I of this translation, and get the book ready for publication. This book had been sold out for a while, and had Swamiji’s original (l957) plea to the Vedantins of the day, and some of the critique received. The uniqueness of this publication is that it gives the reader a good overall view of Swamiji’s core philosophy, and his ideas on Shankara’s system of Advaita in a few pages. I believe this is a seminal addition to Swamiji’s biography. I am very glad to have played a small role in bringing Swamiji’s philosophy and life out in English. I thank Late Sri Lakshmi Narasimha Murthy for having written/republished Swamiji’s biography in l996, giving me a chance to translate this to English. I thank Sri Stig Lundgren of Sweden for coaxing me to take up this task. l also thank Sri Subhanu Saxena and Bhaskar for helping and encouraging me. I thank my father, Sri T.N. Nagarajaiah for helping me in translating difficult sections, and Sri Chandramouli Avadhani for encouraging me all along. Last, but not the least, I thank my family for cooperating with me on this task. My husband took over many of the house hold chores at night, my kids sat around me keeping me company late at nights, and sometimes typed the draft as I narrated. I fondly remember my maternal grandfather, Late Sri Kudlur Tarikere Sri Nivasaiah, who spent most of his time with Swamiji and Sri Jnananandendra Saraswathi Swamiji (Sri Vittala Shastry in his purvashrama days). His passion for Vedanta and his lifelong dedication to his extended family and community inspired me to take up this task. Finally, I am extremely indebted to the selfless efforts of Sri KS Ramanatha for going through the translation and providing several invaluable comments to improve the quality of the work and rectify the translation. He has painstakingly gone thru the original and the translation, side-by—side and page-by—page, patiently, and helped me immensely to proofread the final product. I sincerely pray that Swamiji’s grace and blessings flow through him to everyone around him. I have used ITRANS transliteration for Sanskrit words only, especially if they are a part of a phrase or a verse. The scheme introduces upper case letters to distinguish hard consonants from soft consonants, and long drawn vowels from short vowels. Sanskrit words that are used as part of Kannadaor any other Indian languages are spelt appropriately in English. For example, Mahasamadhi is spelt as it is since it is used similarly in several Indian languages. If it were transliterated, it would be spelt as mahAsamAdhi. Another example is tathAcha sampradAyavidAm cacanam.Adhy Arop Apav Adablyam nisprapancam prapancyate. This bhagavad Gita Bhashya sentence is in Sanskrit and to get the correct effect it is transliterated. Sanskrit transliterations are printed in italics and bold fonts. I have tried to enclose book names in quotes. Several passages and words are printed in bold font in order in readily draw attention of the reader. The reader of translations even when there are no exact words in English are simply spelt appropriately to get an idea of the pronunciation. I hope the reader will not be disappointed to find several non English words in the translation. The life history of highly revered brahmibhuta Sri Sri Satchidanandendra Saraswati Swamiji of Adhyatma Prakasha ,Karyalaya, Holenarasipura published for the first time by the Karyalaya in 1973 as "Karyalayada ltihasa" • “‘A history of the Karyalaya". Sri Sri Swamiji shed his mortal coil in Augustl975. His Samadhi was established next to the temple for Digvijaya Rama in the Karyalaya’s compound based on Swamiji’s intentions as he had instructed hi s disciples, Accordingly, the Mahasamadhi has been established, and Aradhana is being conducted every l3‘l‘ day of the dark half of4* lunar month (Ashadha bahula thrayodasi), for the last 22 years. With all copies of the former publication being sold out, and devotees requesting Swamiji’s life history, this publication, which includes the events until Swamiji’s Mahasamadhi, and the title changed to “Sri Gurucharitamrita", is being published. The Karyalaya’s history has been integrated with Swamiji’s life in this publication. This edition is being released after proofreading and editing the former publication while preserving the intent and the content as far as possible. The devotees are requested to encourage and promote the cause by buying this book. This book detailing Swamiji’s life contains no miracles or supernatural episodes. Swamiji led a simple life as a common man and utilized a major portion of his life towards his spiritual progress and philosophical quest. He was able to utilize all events of his lifetime towards spiritual growth, and with God’s grace was able to pen more than l6O books in Kannada for the welfare of Kannada people. He published "Adhyatma Prakasha" — a monthly edition, continuously for 45 years. With his grace and benevolence, this monthly is continuing to gain popularity among the spiritually inclined. His compositions and writings are being published again and again. Swamiji’s works in Sanskrit and English, about 40 in number, have helped in satiating the hunger of the spiritually inclined in many countries. In this way, performing service to humanity through writing books, discourses, debates, etc., Swamiji ’s life story of 96 years has to be learned and appreciated by reading this book. The famous Kannada writer D.V Gundappa has given Swamiji the title Purusha Saraswathi. We sincerely hope that the readers will cherish reading this divine life story and become truly blessed. The readers are requested to buy this book, and all other books in the Karyalaya, and encourage and support the institution. "Sri Lakshmi Narayanabhyam Namah" - paying my obeisance to Sri Lakshmi and Narayana, I am starting to write the life history of the founder of the Adhyatma Prakasha Karyalaya - Sri Sri Satchidanandendra Saraswathi Swamiji. Adhyatma Prakash a Karyalaya of Holenarasipur is a spiritual organization established by Sri Swamiji before he took sanyasa. It was founded in 1920 when Swamiji was in Bangalore during his purvashrama days, later it moved to Holenarasipur and until 1945 was housed in my Guru's house itself. Therefore, I will narrate my Guru's life story during his purvashrama days first and then relate the story of the Karyalaya that he founded and nourished. As Swamiji himself has narrated, his life history tells us how incidents starting right from his childhood had been a guiding light for him to pursue and lead others on the spiritual path. It also shows how with God's grace even small episodes can have life changing effects. But people who transform such incidents into stepping-stones for spiritual progress and welfare of others are very rare. The character of this life history is of one such rare person. He was not an avatara purusha, but estimating the spiritual boost people got through this individual, it is obvious that the Lord has been very kind towards aspirants and seekers. Indeed, it wouldn't be wrong to say that the Lord of the universe transformed a part of himself to come down as Swamiji and accomplished this great task to the advantage of spiritual aspirants. Therefore the life history of this godly personality is very sacred and invaluable to aspirants. Spiritual knowledge has to be acquired from scriptures through a shrotriya and brahmanishta Guru to be effective. Hence I wish to say that reading about the Guru's life history is as important as reading the spiritual works of the Guru. Such a life history bereft of miracles and useless clutter, though simple and elegant, will nourish, enthuse and prepare the reader's mind for Vedantic study. Later, the reader will develop a thirst to read and understand the more than two hundred books authored by our revered guru in Kannada, English and Sanskrit. All instances narrated here are historic episodes and were narrated personally by Swamiji himself. Now, let us begin with an introduction to the place where our revered Guru's ancestors lived.